If ever there were a case of "don't judge a book by its cover," it's two dozen Ood advancing on you, chanting "we must feed." Though you can forgive anyone in that situation for jumping to conclusions. With their Lovecraftian visages, their blank-faced stoicism, and the carefully neutral voices emerging from their translator spheres, the Ood are instantly unsettling - they seem like a quiet, brooding menace, just waiting to explode. But though they do, by various means, spend plenty of time killing off hapless extras and threatening the Doctor and his companions, there's no malice in them. They're a tragic monster, entirely victims of circumstance, as thoughtlessly used and expended by the forces of evil as they are by their human masters. Befitting their menial stations, the Ood wear nondescript work clothes, drab grey suits distinguished from one another only by the numbered bar code patches on their chests. The action figure faithfully reproduces the look, with a simple sculpt with understated detail conveying the monotony of their attire without actually being boring itself. 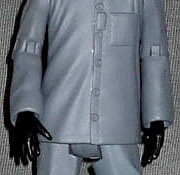 The arms and legs of the suit have some gentle creases into them - the workmanlike garments not being tailored, but simply one-size-fits-all - and the body of the coat, which is soft plastic, is a perfect match for the hard plastic sleeves and trousers. The plain black shoes are molded as part of the lower legs, but the black gloves extend from hollows set into the sleeves on the arms, making them look more realistic. The only omission is the bar code tag - there's a spot for it in the sculpt, but no paint app to represent it. Their wardrobe might not be much to look at, but the head on top of that drab body is full of interest. Harking back to all manner of Cthonic nastiness, the Ood lower face is a mass of wet, soft tentacles, reproduced fairly well by way of heavy crimson wash over a light base colour, giving both the necessary variation in colour, and the shiny, moist appearance of the real thing. The remainder of the head is grey, the skin leathery and elephant-like, well detailed with patterns in the thick skin surrounding the wide-set slitted red eyes. As well as a gentle shade from grey at the face to off-white at the back of the skull, there is a spattering of dark spots on the crown of the head, applied randomly but close enough to the on-screen appearance to pass. 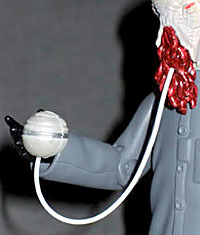 The Ood has a swivel neck, peg shoulders, pin elbows, peg wrists inside the sleeves, a peg waist beneath the coat, balljoint hips, and pin knees. The neck is a disappointment, as the mounting within the collar of the coat would easily have allowed a balljoint at the bottom of the neck, although with the mouth-tentacles being a rigid piece, too much tilt on the head would have had them "hanging" at an angle. The rest of the articulation is quite sufficient for a figure of this size and type, allowing various unremarkable poses - all told, though, the best look for an Ood, no matter how mobile it may be, is standing still, waiting for orders, and being subtly scary. Their subtle creepiness and bland uniformity may not make the Ood the most flashy of villains - certainly not to compare to the Daleks or the Cybermen - but they certainly made their mark, having made their debut in one of the best episodes of the new series, and played a memorable role in it. This is a fine action figure representation of them, and no Doctor Who collector should be without one.